South Louisiana is experiencing incredibly cold weather. Temperatures are dropping below freezing overnight across the state and are expected to stay cold throughout the first week of January. You will be hearing TV news anchors and radio station disc jockeys reminding people to protect the Three P’s. Pets. Pipes. Plants. Providing appropriate shelter from the elements for your outside animals is more than a duty to your pet, it’s your legal responsibility. Under the Proper Shelter Code of Ordinance (Ord. No. O-142-2017, § 3, 8-8-2017), Lafayette Parish residents are required to provide proper shelter for outdoor animals. The shelter must meet these minimum requirements. The shelter must have a roof, three sides, an entryway, and a solid, level floor. Covered porches, covered patios and covered carports shall be deemed proper shelter for dogs if adequate protection from the elements is provided. (i) Be constructed of such material and in such a manner as not to pose a threat to the health and safety of the dog being housed. (ii) Be of adequate size to allow for the dog to stand, turn around, and lie down without touching the sides or top of the shelter. (iii) Have sufficient bedding material or other means of protection from the elements when weather is colder than what a dog of that breed and condition will comfortably tolerate and that will allow the dog to retain body heat. (iv) Utilize bedding material which shall be kept clean and dry. Just because they have that furry coat doesn’t mean that animals can tolerate the cold better than humans. They are subject to frostbite and hypothermia just like we are. Our animal friends need our help staying safe during cold weather. Limit Outdoor Time in Winter – Take short, frequent trips outside when needed. Avoid long exposure to the elements. Comfy Bedding – Don’t make your pet sleep on the cold tile floor. Warm blankets and stuffed beds provide padding for comfort and keep your pet off the cold floor. Heater Safety – Animals will seek out the warm spots to nap. Make sure space heaters and fireplaces are pet proofed. Hydration – Make sure your dog has access to water. They can dehydrate just as quickly in the winter as they do in the summer. Groom Your Dog – Your dog’s coat needs to be clean and well groomed to keep it properly insulated. But be careful, over bathing can cause dry skin. Never Leave Your Dog in the Car – Whether hot or cold, your pet is subject to extreme temperatures when left in a vehicle. Toxins – Anti-freeze has a sweet taste that attracts animals. Even small quantities can be fatal to an animal. Keep the bottles stored safely. Clean up all spills. What Should I Do If I See An Animal In An Unsafe Environment? 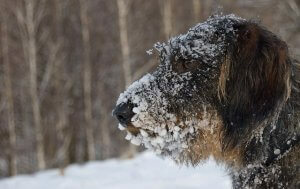 Cold weather can be deadly for outdoor animals. If you see a pet left out in the cold weather, Lafayette Parish Animal Control reports that you should call the police. Officers should respond to reports of animal neglect and cruelty. 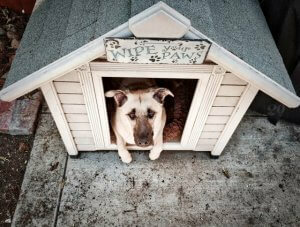 Leaving a pet outside without adequate shelter is a crime. Reports of animals left outside during dangerous weather are more common than any other form of animal abuse. Keep track of date, time, exact location and the type of animal left outside. Write down as many details as possible. Take pictures and video of the animal, it’s surroundings. You can give this information to the police. Contact the local animal control agency in your parish. They may have specific contacts within the sheriff’s office that can assist in getting the animal to safety.